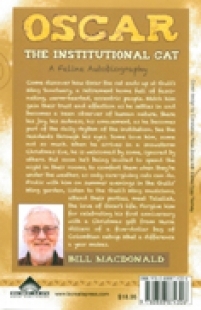 About the Book Come discover how Oscar the cat ends up at Gull's Wing Sanctuary, a retirement home full of fascinating, warm-hearted, eccentric people. Watch him gain their trust and affection as he settles in and becomes a keen observer of human nature. Share his joy, his sadness, his amazement, as he becomes part of the daily rhythm of the institution. See the residents through his eyes. Some love him, some not so much. When he arrives in a snowstorm Christmas Eve, he is welcomed by some, ignored by others. But soon he's being invited to spend the night in their rooms, to comfort them when they're under the weather, as only care-giving cats can do. Frolic with him on summer evenings in the Gulls'; Wing garden, listen to the Gull's Wing musicians, attend their parties, meet Talullah, the love of Oscar's life. Forgive him for celebrating his first anniversary with a Christmas gift from Nurse Villiers of a five-dollar bag of Colombian catnip. What a difference a year makes.